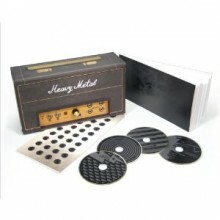 The Heavy Metal Box could easily be any metal fan’s ultimate package. Featuring four disks of just about every popular and noteworthy metal band from the late 1960’s up until the early 1990’s, this collection is made up of four discs and over five hours worth of material. For the purpose of this review I was only sent a twelve song sampler, but if the sampler is any indication this will be one of the full compilations worth buying. From the sampler disc, it is quite evident that Rhino Records worked extremely hard to make sure that a variety of bands from each era were included. On the sampler alone you’ve got artists such as Iron Butterfly, Slayer, Scorpions, and even Spinal Tap included. The full collection not only includes all of the aforementioned artists, but also adds in groups such as Dio, Venom, Metal Church, Anthrax, and many more. Just about every name one can think of is included, and though the collection stops at around 1991 that doesn’t prove to be an issue. Not only did Rhino Records get an impressive selection of bands, but they’ve chosen tracks from each group that listeners are likely to know. From Slayer’s “South of Heaven” to Iron Maidens “The Number of the Beast”, these are songs that any long time metal fan is sure to know. By choosing some of each band’s best singles, The Heavy Metal Box is worth your attention. It may be somewhat hard to review a four CD, 70 song collection using only a twelve song sampler but I am confident enough to say that if you’re into metal of any variety and have some extra cash lying around that this compilation needs to be in your collection. By compiling memorable songs from over thirty years worth of material, little ground has been left untouched with The Heavy Metal Box. Collections like this don’t come along all that often, and would be the ultimate gift for any genre diehard.